The Newsteo Tracker TRP55 is a shock data logger that measures, records and locates shocks or temperature change during the transportation of goods. After having configured and activated the Newsteo Tracker TRP55, simply fix it in the container, truck, box… before it leaves. The Newsteo TRP55 Data Logger continuously measures various parameters and stores corresponding measures. Upon arrival, the measures are wirelessly downloaded on PC, through the package of the good: no need of opening the package. 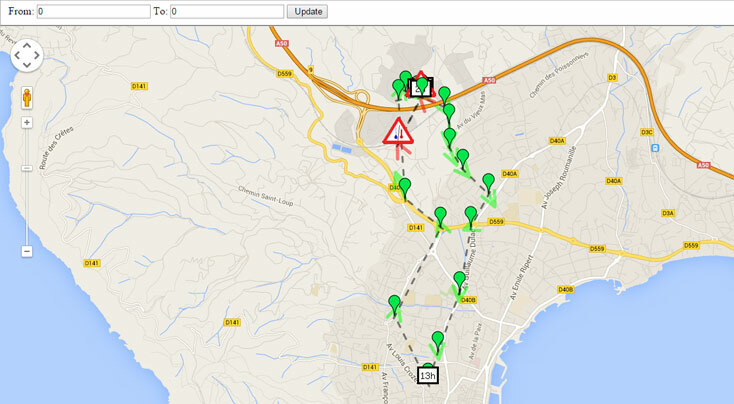 The journey made by the goods are materialized on a map, on the software installed on the PC. A PDF report is created and allows you to view all the measures taken by the Tracker TRP55. Who uses the Newsteo shock data logger? Ground speed: from 0 to 155 km/h, resolution of ± 5 km/h. Can be set from one measure every minute, to one every 4 hours. 129 000 mesure blocks, one shock using 3-4 blocks (corresponding to 1 record campaign of 2 years, with one temperature measure every hours and 20000 shocks). 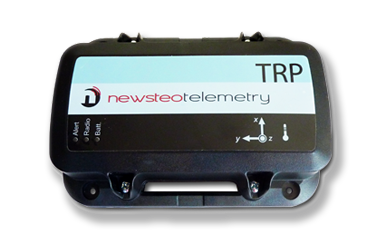 This kit enables you to estimate the Newsteo Tracker TRP 55. A CD-ROM containing the installation of the RF Monitor Premium software with USB drivers, the application software of the Tracker which enables the restoration of the recorded measures, data localisation, and the documentation. Price of the kit: 750 EUR excl. VAT, preparation and shipping costs in addition.